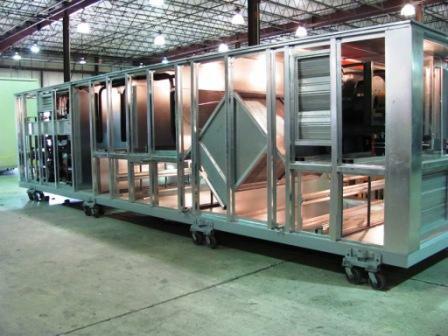 32,000 CFM Plate heat exchanger for an energy recovery unit going to the University of Arkansas. Fixed Plate Heat exchangers – Seasons 4 works with and sources plate heat exchangers from Innergytech. Available in both Enthalpy and Sensible formats, and available in several different arrangement whether it be straight energy recovery or a pre-cool, reheat arrangemnt, we’re sure to have a solution that fits your needs. Energy Recovery Wheels – Seasons 4 works with and sources Energy recovery wheels from several manufacturers. Available with both Total Enthalpy or Sensible only media as well as single wheel, dual wheel arrangements, a Seasons 4 unit is sure to reduce energy consumption. Heat pipes – Seasons 4 has extensive knowledge of heat pipe systems. 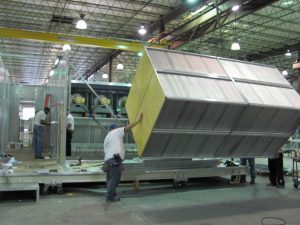 Over the years we’ve manufactured both energy recovery and wrap around solutions for numerous customers. Desiccant Wheel solutions – When DX cooling isn’t enough, Seasons 4 will use a desiccant energy recovery wheel to reduce humidity levels well below 40 degrees dewpoint. Available with either a passive desiccant or an active (regenerated) desiccant wheel, Seasons 4 can provide units to meet space critical temperatures. Our units are available as Package DX Energy recovery solutions as well as air handling units with either Chilled water or DX cooling options, gas heat, electric, steam and hot water. See our brochure below highlighting some of our designs and arrangements.